On 9th of March 2018, OpIndia published an article that busted an impending hitjob on Arun Jaitley and his daughter’s law firm by the leftist propaganda website, ‘The Wire’. OpIndia had received information that there was a concerted information to somehow link Arun Jaitley to Mehul Choksi, the tainted businessman, whose scam had invariable landed at the Congress party’s and P Chidambaram’s doorstep. We also received information that the law firm, that was engaged by the tainted businessman in December 2017, terminated its contract and returned the retainership it within a month, before providing any sort of legal assistance to Geetanjali Gems. Surprisingly, when ‘The Wire’ had sent their questionnaire to the law firm, they had categorically mentioned that their story was complete and they wanted to run it ideally with the firm’s response. How then did they decide “there was not much of a story after all” is a little sketchy, but we digress. It comes at a time when former Finance Minister Chidambaram is in the dock for the INX media case. Plus, Chidambaram is also in the gaze for signing a last minute order which primarily benefited Choksi’s and Nirav Mehta’s firms. A report which links Choksi to Jaitley then would make life much easier for Chidambaram. Unsurprisingly, it may seem like our observation might be coming true after all. Today, Rahul Gandhi in another epic self-goal plugged ‘The Wire’s’ article that claimed “there wasn’t much of a story after all” in a bid to indict Arun Jaitley and his daughter’s firm in the PNB scam. The screenshot of Rahul’s tweet has been attached before because the Congress party and Rahul Gandhi have developed a habit of making such embarrassing gaffes and then deleting their tweets. 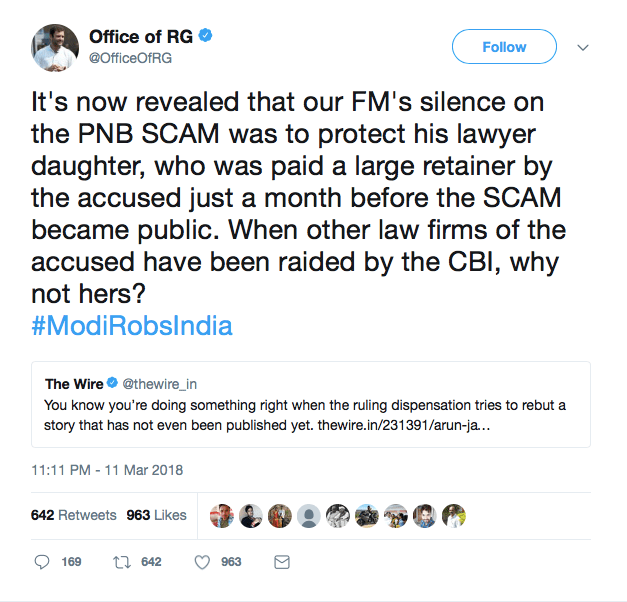 To summarise, Rahul Gandhi tweeted that the Finance Minister’s silence over the PNB scam was to protect his daughter’s firm that got a large retainership just a month before the scam broke out. He plugged an article that conceded “there wasn’t much of a story” to publish after finding out the law firm had returned the retainership once the scam broke and had not represented Mehul Choksi at all. He plugged the article that basically conceded that the OpIndia story was indeed correct and that Arun Jaitley, his daughter or their law firm cannot be connected to this scam which is why they dropped this story. While all of Rahul’s idiotic gaffes and lies are laughable, and one might feel compelled to laugh this one off too, there is a larger question here. Rahul Gandhi plugged an article from a sympathetic portal, distancing Arun Jaitley from the scam, as an indictment of his involvement. That makes me believe that Rahul Gandhi or the Einstien that runs his Social Media account did not even read the article they were about to plug. Now, it is said that what can be attributed to stupidity should never be attributed to malice, but, in this case, while the stupidity is a foregone conclusion, the malice must also be examined. The only reason an official handle would plug an article without even reading its contents can be that the handler thought they knew what the contents of the article from a sympathetic website would have. If we were to make an educated guess, should we assume that Rahul Gandhi and the Congress party knew that ‘The Wire’ was planning a hit-job to link Arun Jaitley to the tainted businessman? Which in turn would mean, that the Congress perhaps wasn’t aware that their latest hit-job had been preemptively foiled? We had pointed out how there seems to be a concerted effort by ‘The Wire’ to link elements who are perceived close to the Prime Minister with the tainted businessman perhaps to shift focus away from the fact that P Chidambaram has found himself smack in the middle of this financial scam by Mehul Choksi and Nirav Modi? Can we conclude that perhaps this is the reason why ‘The Wire’ hasn’t written a single article about P Chidambaram sanctioning the diluted 20:80 scheme on the day Congress lost 2014 elections, that basically facilitated the scam perpetrated by the duo? It almost seems like some PR professionals have been hired to try and link any official to the Nirav Modi – Mehul Choksi scam in order to shift the focus from Congress. On a lighter note, this seems like Rahul Gandhi ended up tweeting the same text that he was supposed to tweet when hitjob by ‘The Wire’ is published. We should now know who in ‘The Wire’ has been leaking editorial plans to Rahul Gandhi. Or is Rahul Gandhi a central part of the decision making process?